Livestreamed at the Miller Gallery at Carnegie Mellon University, 3rd floor. 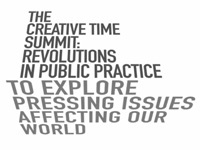 The Summit takes place at Cooper Union in New York and you may follow the event live via Livestream at the Miller Gallery at Carnegie Mellon University or online. In addition, writer, activist, and artist Gregory Sholette will be Tweeting from the event, as well as moderating the post-event online discussion. These artists consider alternatives to the market economy via their art practice. While their methodologies range from cottage industries to alternative currencies, and from grassroots funding models to barter economies, the implications of their practice is grounded in an opportunity to produce new realities via the means of production. In its continued, manic, consumptive pace, the contemporary art world seems already prepared to digest and move past what cultural theorist Irit Rogoff has described as the “pedagogical turn.” With numerous alternative schools being produced, as well as increased interest in pedagogy as an aesthetic methodology, we turn to artists whose interest in models of alternative education provides an opportunity to think through this moment. We invited six curators (three each day) to provide brief, 15-minute overviews of socially engaged art in their regions. These reports are meant as rapid-fire opportunities to consider a vast array of practices operating around the world. CSAs, Slow Food, community gardens, organic, free-range, and an avalanche of critical food industry films that could make one’s stomach turn have ushered in a renewed interest in an obvious topic: food. The artists in this session focus not only on the politics of food industries, but also the uses of food in producing social cohesion. While the term “inter-disciplinary” does not adequately encompass this work, we find artists increasingly interested in a combination of analysis of a region as well as action within it. When viewed from the perspective of an updated geography, the aesthetics of artists’ work in space raises new, and potentially more socially pertinent questions. 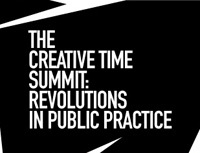 At last year’s Creative Time Summit, the artist Laurie Jo Reynolds called for a “legislative art.” In working on reforming the policies surrounding maximum-security prisons, her political commitments forced her work to push past the gesture and toward structural change with legislative policies. The artists in this session deal with these questions from a myriad of perspectives: some antagonist, some reformist, some, even, in-office. Where does the white cube end? What are the potentialities and problematics of power congealing and functioning within spaces we call “institutions,” both in the art world and beyond? These artists reflect and consider not only the legacy of institutional critique, but more broadly, the role of artists in relation to systematized power. Inspired by the ongoing “Plausible Artworlds” project of the Philadelphia-based collective Basekamp and theorist and writer Stephen Wright, this final session asks artists to describe their work in producing alternatives to the mainstream art world. Their work not only provides models for considering how to make and function in culture outside the capitalist art market, but also to consider one’s own line of flight for the production of dynamic cultural potentialities.